The traditional trapunto topstitching is just one of the many exquisite details of this buttery soft jacket! The deep and wide trapunto topstitching runs from hem to hem in front and around the neckline in back, adding sensational textured dimension. The sleeves taper towards the cuffs, which also feature 6" of trapunto stitching. 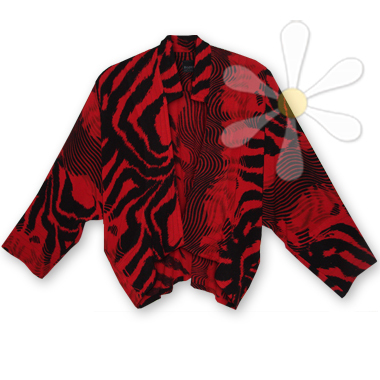 Of course, the tiger print in black on ruby is ferocious! Toss this on and release your INNER WILD!